Guitarist John Jorgenson has contributed licks to nearly every genre of popular music, from country to pop to opera. But one style keeps calling to him. Now usually referred to as gypsy jazz, it's the percussive, joyful, utterly swingin' music pioneered by Django Reinhardt's Quintet of the Hot Club of France in the 1930s. The complexity of the music got him hooked, Jorgenson says, and its passionate emotionality invited him to stay. A multi-instrumentalist who has rightfully earned the honorable mantle of virtuoso, Jorgenson has performed with a remarkable list of musicians that includes old-time country queen Rose Maddox, former Byrd and Burrito Brother Chris Hillman, Bob Dylan, and Emmylou Harris. He played on tour with Elton John for six years. 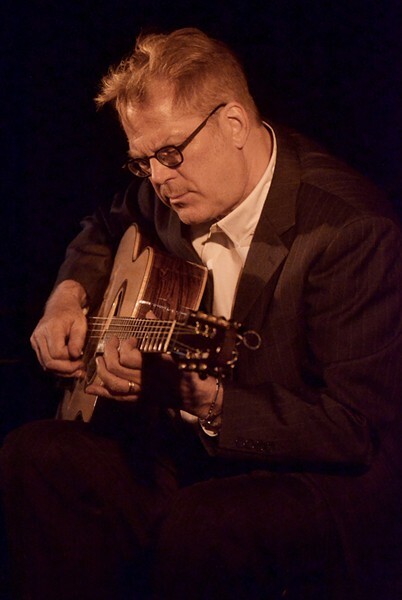 In advance of the John Jorgenson Hot Club Jazz Quintet's performance at the University of Vermont Recital Hall on Friday, March 6, the guitarist spoke by phone with Seven Days about Reinhardt, Cab Calloway and Sir Elton. SEVEN DAYS: What do you love about gypsy jazz? JOHN JORGENSON: It's very melodic, very high energy, and there are a lot of dynamics. It's accessible music, I think, and appealing to people who have never even heard of it. It's not cerebral. I mean, there's a lot of technical virtuosity, but that's never the main point. The point is all about emotion. Audiences say that our music takes them to other places. And that's the intent. SD: You've played in so many different genres. What keeps calling you back to this one? JJ: I really felt a connection to it in my heart. But for most of my career, it was such an underground, niche music that there wasn't a chance, that I could see, to make it my professional style. I started getting really interested in it in the late '70s and, at that time, people just didn't know about it. I think the internet really helped this style of music, in that it allowed people who were interested in it to find each other. [In the late '90s,] some companies started making some affordable versions of gypsy-jazz guitars. Hot Clubs of (fill in city here) started popping up everywhere. Soon, there was a circuit and some festivals. I never expected that would happen. SD: Your list of musical collaborators is astounding, but there must still be some musicians, living or dead, with whom you would like to work. JJ: It would be amazing to play with Louis Armstrong, because he just embodies everything that is at the root of American music, I think. Along those same lines, Cab Calloway. I actually got to see him perform a few times and got to spend some time with him. [In the 1970s,] I worked as a musician at Disneyland, and they would bring in big bands every summer. He came to play there twice. He had to have been in his seventies at that time, but he was dancing around as he was conducting. He came back another time and was happy to sit with me for an hour and answer my questions. He could remember the names of all his old band members. And, of course, [Hot Club of France violinist] Stéphane Grappelli. I met him a couple of times but never got to play with him. SD: You've also been involved with designing some guitars for Fender. JJ: Yeah, I actually worked with Leo Fender himself. He had a company called G&L, and I was an endorser of their guitars and also a sort of guinea pig. He would have me play prototypes and ask me questions about them. That was a fantastic experience. After he passed away, I got involved with the Fender company directly and designed a couple of different guitars. I've also gotten to design gypsy-jazz guitars with a company called Gitane. It's all about mechanics, really. Some guys like working on cars; I like working on guitars. There are even tentative plans for me to start my own guitar company; that's just in its infancy now. SD: Do you ever feel like the label "virtuoso" is a kind of hindrance? JJ: Only maybe in other people's perceptions. It does feel like a slight bit of pressure — you'd better show that you are a virtuoso every time. I don't want technique and virtuosity to be the primary thing that people expect from a concert; then again, I don't have any control over what people expect. I want people to be more interested in the dynamics and the method and the overall emotions of the music, whether it's "technical" or not. But it's interesting that you mention that word, because a project coming out later this year is that I'm packaging three albums together. One is gypsy jazz, one is bluegrass and one is electric-guitar rock. The title of the package is The Virtuoso (my managers' idea), to show that it's unusual for one performer to play these different kinds of music at a high, virtuosic level. SD: You must have some stories from your six years on tour with Elton John. JJ: I love his music. Goodbye Yellow Brick Road and especially Blue Moves were big albums for me growing up. When I joined up with Elton, he was having a return to that style of music with his album Made in England. [My band] the Hellecasters were doing really well, and I didn't want to just drop everything. But then he played me the album and I loved it so much that I had to do the tour. It was supposed to be one tour, but eventually stretched to six years. The depth of his catalog is fantastic, and it was extraordinary to play those songs with him. He's got a wicked sense of humor and he doesn't take himself too seriously. He might be known for throwing tantrums or whatever, but I never saw anything like that that wasn't justified — like when someone was lying about him or trying to pull the wool over his eyes. He was fantastic with the musicians. He never gave the musicians any trouble whatsoever, and all the band members, in return, would want to give him their best every night. That was a very dedicated and loyal and consistent band.